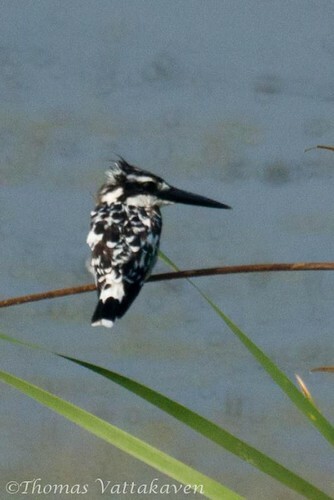 The Pied Kingfisher (Ceryle rudis) is estimated to be the world's third most common kingfisher, and is a noisy bird, unmissable within its range. 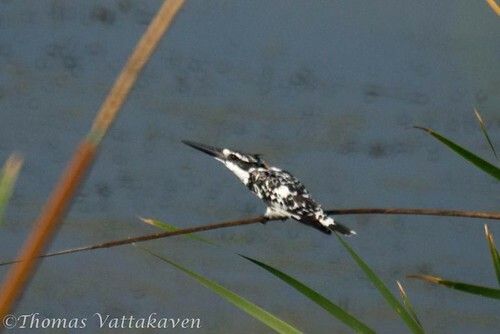 However it has remained an elusive bird to me so far… Not any more! 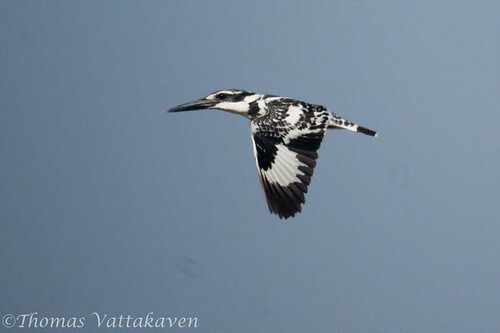 Here are some images of the bird taken on a birding trip to Anekal Lake. 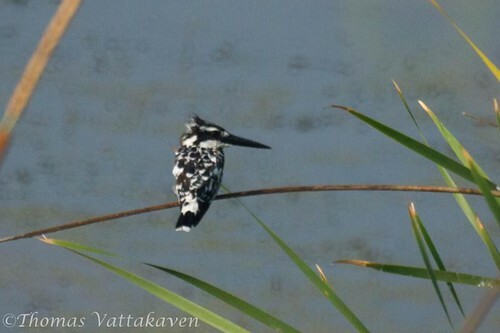 This Kingfisher, unlike most of the other species found in India is white, with a black mask, a white supercilium and black breast bands. It has a neat crest in which the upperparts are barred in black. This species is common throughout sub-Saharan Africa and southern Asia from Turkey to India to China. 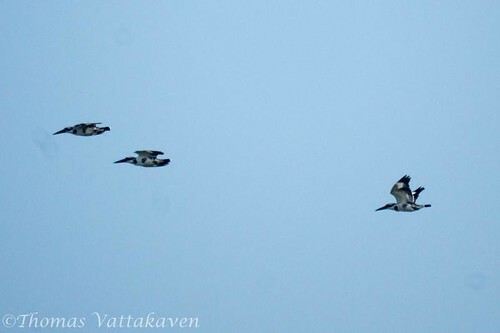 They are resident, and most birds do not migrate, other than short-distance seasonal movements. 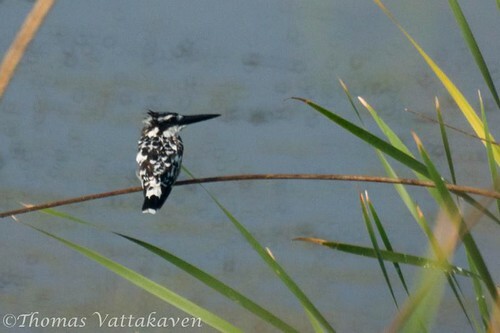 In India it is distributed mainly on the plains and is replaced in the higher hills of the Himalayas by the Crested Kingfisher. 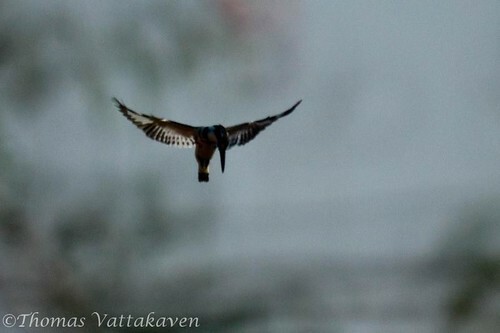 They can deal with prey without returning to a perch, and so can hunt over large water bodies or in estuaries that lack perches that are required by other kingfishers. 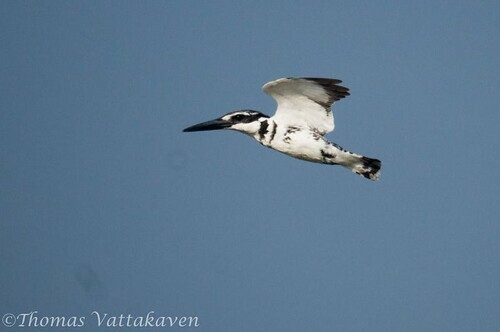 It usually hunts by hovering over the water to detect prey and diving vertically down bill-first to capture fish. 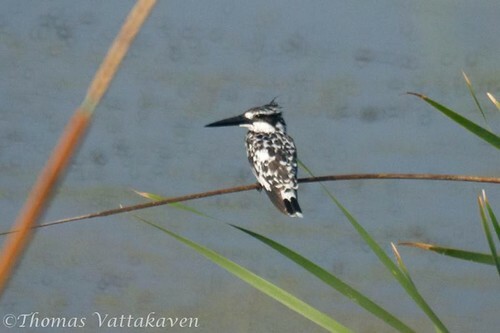 They can deal with prey without returning to a perch, and so can hunt over large water bodies or in estuaries that lack perches that are required by other kingfishers. The breeding season is February to April. Its nest is a hole excavated in a vertical mud bank about five feet above water. The nest tunnel is 4 to 5 feet deep and ends in a chamber. Several birds may nest in the same vicinity. The usual clutch is 3-6 white eggs. 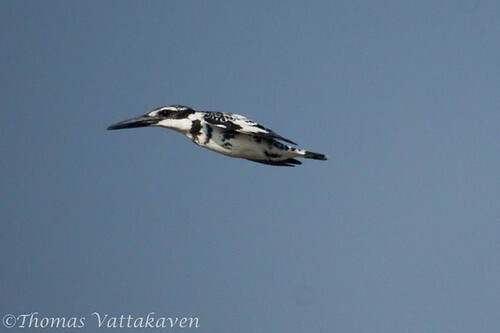 The pied kingfisher sometimes reproduces co-operatively, with young non-breeding birds from an earlier brood assisting parents or even unrelated older birds.